A coconut vendor outside the San Francisco de Assisi church in Belo Horizonte. 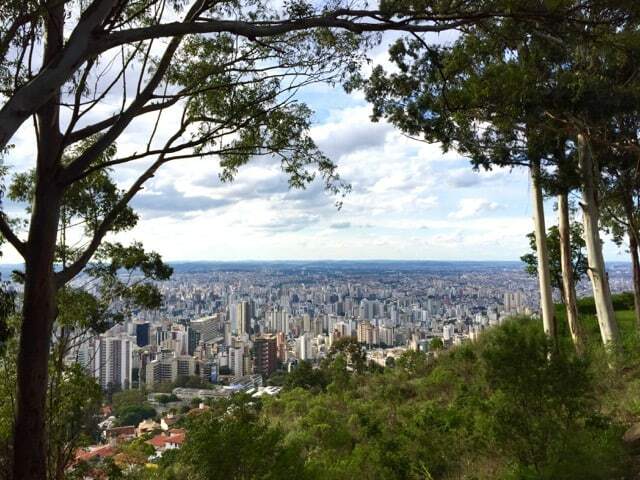 To truly appreciate the vastness of Belo Horizonte and to see the horizon, head to the viewpoint at Mirante do Mangabeiras. The view is simply phenomenal! The view from Mirante do Mangabeiras. 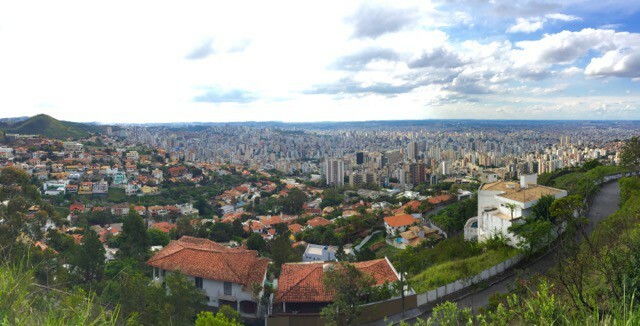 A panoramic view of Belo Horizonte. Oscar Niemeyer is arguably Brazil’s most famous architect. His works include the civic buildings in Brasilia (the capital of Brazil), the United Nations headquarters in New York and the Centro Niemeyer in Spain. I’m a big fan of his futuristic, curvy designs so I was thrilled to learn that he had designed various buildings in the city, including the museum where I had my presentation. The Modern Art Museum in Pampulha, one of the earlier works of the famous Brazilian architect, Oscar Niemeyer. I was thrilled to have the opportunity to speak here! Me speaking at the RBBV conference in the Modern Art Museum in Belo Horizonte (image by Alessandra Fratus). The conference I attended was held at the Museum of Modern Art in Pampulha, a leafy district north of the city centre with a massive lake in its middle. This man-made lake and the surrounding buildings was the first big project for Oscar Niemeyer, who went on to design the country’s capital, Brasilia, and countless other buildings around the world. I was thrilled to have the opportunity to speak at this illustrious venue, which was originally meant to be a casino. 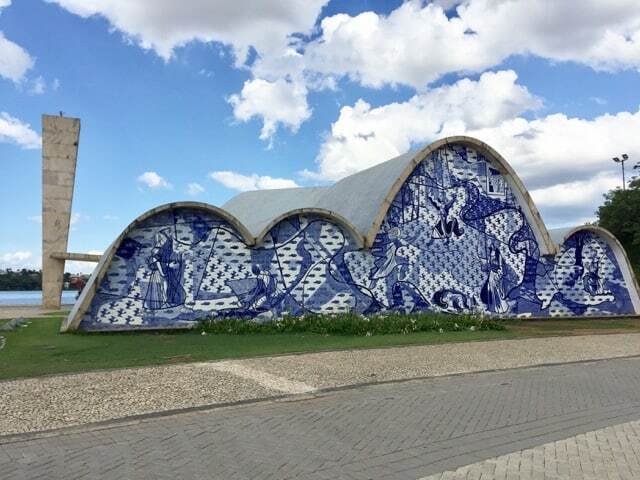 The San Francisco de Assisi church in Pampulha is another of Oscar Niemeyer’s intriguing designs. Niemeyer’s signature curves at the Edificio Niemeyer, located next to the Praça da Liberdade in the city centre. I love markets so the Mercado Central (Central Market) was one of my highlights in Belo Horizonte. Listed as one of the best in the world, this market is a wondrous maze of little stores and bars. Foodies are in for a treat as there are countless stores selling all sorts of Brazilian meats, cheeses and candy. Drop by at one of the bars for a beer and some delicious bar food! 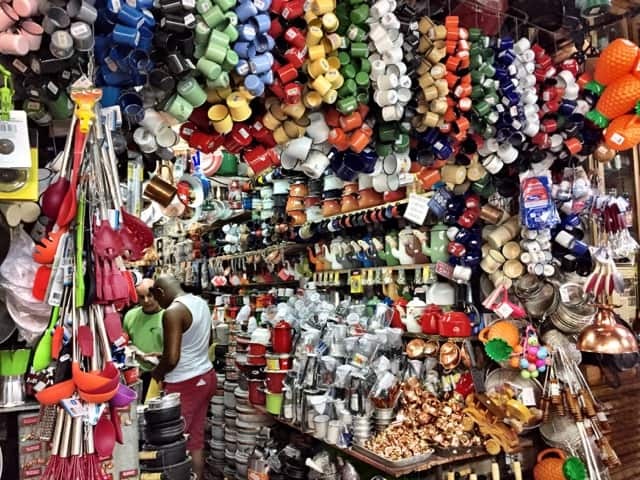 One of the most colourful shops in the Mercado Central! There are lots of cheeses to choose from. Crab-flavoured cachaça (a Brazilian spirit made of sugarcane juice and used to make caiprinhas). I stood there for a while wondering how they got the crab in the bottle! I still have no idea! A shop specialised in cachaça. Grab a beer and some bar food and mingle with the fun-loving locals! Savassi is a vibrant district where many hotels, restaurants and bars are located. In the evenings, the district is a magnet for locals who gather at outdoor terraces for drinks and food. Check out the Penguim bar/terrace and Albanos (which serves their own delicious brew!). I loved the Albanos beer! The Praça da Liberdade (or Liberation Square) is one of the main squares in Belo Horizonte. What makes this square particularly interesting is that it’s lined by palaces which have been turned into museums and cultural centres. The architecture, ranging from neo-classical to Art Deco, is eclectic and a joy to see. The park in the middle of the square was inspired by the gardens at the Palace of Versailles and is a favourite haunt for locals, especially in the weekends. Add a visit to the Palácio da Liberdade – the former seat of the government of Minas Gerais (the state in which Belo Horizonte is located) – to admire its grand interior. The park at Praça da Liberdade with the Palácio da Liberdade at the end. The Mines & Metals Museum at Praça da Liberdades. Visit the stunning Banco do Brasil Cultural Center. There are many more things to do in Belo Horizonte but I didn’t have the time unfortunately. However, I left the city charmed by its beauty, vibrancy and wonderful architecture and I wondered why it’s still relatively off-the-beaten-path for visitors to Brazil. I, for one, would love to return one day and experience more of BH! More tips: if you’re a fan of nature strolls and modern art, plan a visit to Inhotim park, about an hour’s drive from BH. Read more about Inhotim on Velvet Escape. If you love culture and history, be sure to plan a road trip along the Estrada Real from BH to Rio de Janeiro! Belo Horizonte can easily be reached by air from all major cities in Brazil. From Rio de Janeiro, it’s a short 45-minute flight. From the airport, it can take more than an hour to reach the city (depending on traffic). Use only official taxis! ← The ultimate Euro food trip! Thanks Reba. I had the same as you before my visit. Turned out to be a very cool city! Belo Horizonte is a place that never registered with me prior to this post, but it is on my list of places to see in Brazil now. Great pictures! Thank you Linda for your lovely comment! Brazil and South America have so much to offer to visitors. I’ve only seen a fraction of the continent but Brazil is definitely a fave of mine! I’ve never been to Brazil — or South America, but I’m sure interested after reading your article. The photos are great!